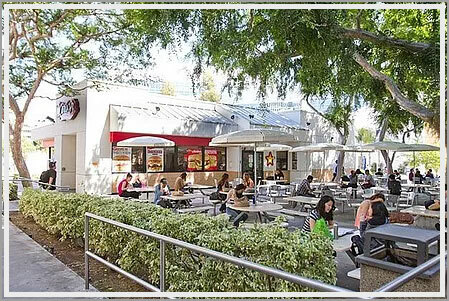 Carl’s Jr. is located on the east side of campus and offers a wide variety of affordable meal combos when you want the most bang for your buck. Did you know that in 1941 Carl Karcher and Margaret Karcher borrowed $311 on their Plymouth automobile and purchased a hot dog cart which they operated at 1108 North Harbor Blvd in Anaheim, California? One cart grew to four, and in less than five years, they owned their first restaurant with hamburgers on the menu in Anaheim, California!